The tests are so-called “end-of-course exams,” which are administered by the state. 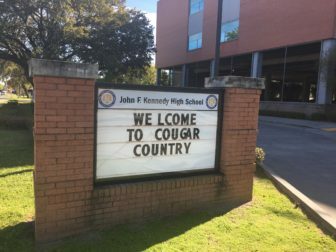 Of the 144 exams at Kennedy, four were voided completely and did not count as part of the school’s 2018 state performance score, which was a C overall. The other students’ second test counted, she said. Dunn said those factors were accounted for in the school’s 2018 school performance score. New Beginnings administrators did not respond to a request for comment for this story. Louisiana has been in the process of transitioning to new exams that match higher state standards over the last several years. Last year, the high school U.S. History test was one of those updated tests. Dunn said students who were taught with the old curriculum were supposed to take the previous version of the test. Students who learned under the new curriculum were supposed to take the new version. “Students had to retake the correct version of the exam,” Dunn wrote. The voided exams are spelled out in the department’s annual test irregularities report, which will be delivered to the state Board of Elementary and Secondary Education meetings next week. Kennedy wasn’t the only school to report voided exams, but the Gentilly school had by far the most. Kennedy’s 144 voids represent about 20 percent of 697 school-district-initiated voids at 251 schools reported across the state. (Total voided tests statewide, including those voided by the Department of Education, came to 1,221.) The next highest was Homer High School in Claiborne Parish with 40 reported voids on EOC exams. Dunn said administering the wrong test, like what happened at Kennedy, is not common. But several schools have had testing issues over the years. Last year, administrators at Joseph M. Singleton Charter School were fired after the state discovered the school gave special testing accommodations to students who weren’t eligible for the extra help. Accommodations can range from extra testing time to having a teacher read the exam aloud for a student. But students must have written justification to receive such accommodations. In this case, Singleton students didn’t have the required paperwork, state officials said. About 165 students had exams voided and eventually the state dropped the school’s 2017 letter grade from a C to a D.
After a cheating scandal at Landry-Walker High School in Algiers, at least four employees were eventually fired or not re-hired. The investigation revealed inconsistencies in students’ class grades compared to state test scores, and the school’s performance plummeted the following year after more testing monitors were placed at the high school, NOLA.com/The Times-Picayune reported in 2016. That led the state-run Recovery School District to implement new test-monitoring policies. The RSD required all of its charter schools to hire an independent test monitor to observe one day of testing in its schools. The RSD paid for test monitoring at schools that were up for charter contract renewal — the high-stakes year when tests largely determine whether charters will receive another contract and stay open. The Orleans Parish School Board followed suit. A spokeswoman for the Orleans Parish school district declined to comment for this story, referring The Lens to the state Department of Education.